Each winter break, Fairfield University’s Alumni Job Shadow program pairs career-driven students with alumni in various industries for an informational day at their offices. Alumni love to give back to the University and provide opportunities for students to explore different careers and industries, and students really benefit from the program by getting expert career advice, networking, and learning about jobs and internships. The Alumni Job Shadow program first launched in 2011 in collaboration with the Alumni Association, Alumni Relations, and the Career Planning Center. The program is arguably one of the University’s most valuable events, as it offers current undergraduate students the opportunity to spend the day shadowing an alumnus who quite literally walked in their same shoes not long ago. Since its inception, the program has only grown, this year pairing 272 students with 165 industry professionals. 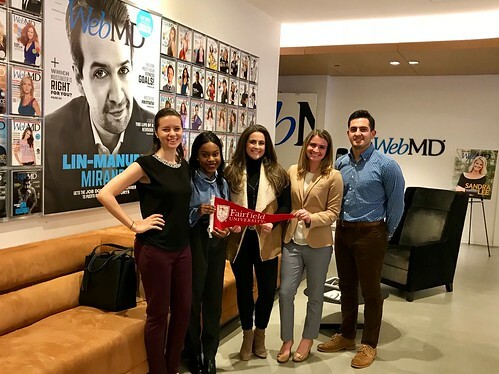 Throughout winter break, students spent the day at POPSUGAR, WebMD, Warner Media, Google, NBC, Daily Mail, and many more prestigious organizations. Over at the New York Structural Biology Center, Giulia Crosio ’20 spend her day shadowing Brian Kloss '88, who expressed his enthusiasm about having Fairfield Students at the office. “I have participated in the Fairfield Alumni Job Shadow Program for several years and I always enjoy meeting with the students. I am continually impressed by their intelligence, maturity, and curiosity. I look forward to participating again next year,” says Kloss. Many of the students reported that the chance to simply visualize in the day-to-day experiences of these alumni gave them a clear picture of what life at the various organizations would really be like. Additionally, the opportunity to meet and engage with other industry professionals gave many of the students a clearer image of office culture and of the many roles and responsibilities that exist within one company. For more information about the Job Shadow Program, please visit fairfield.edu/jobshadow.